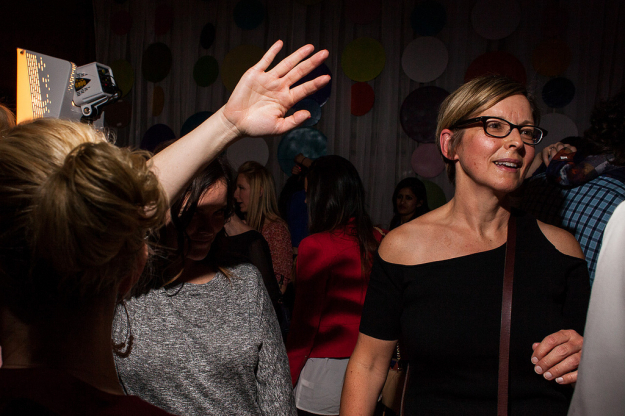 I call this photo "sweaty girl Alt 2013" as it was me in the midst of dancing at the Girls with Glasses mini party. Don't you love that dress? It DID need some major foundation garments. You can't see it in this photograph but it has some lovely structural stitching as well. Very architectural. Right up my style alley. My first Helmut Lang! Oh yes, Alt 2013. When I went last year for the very.first.time I took pages and pages and PAGES of notes. Every panel session was chock-a-block full of information that was new to me. I was SO green. I knew no one and nothing about blogging. Not.a.thing. And I arrived home with masses of to do's and ideas and thoughts and plans and goals. Of course I planned to do them ALL in a few short months. This year? I had a brand new book for my notes (embellished with stick-on jewels from the girl). Not as much note-taking although I DID learn a lot. (They were prettier notes too with my coloured markers). But it was different this time. Not that I know everything, but this time was different. Just as inspiring (maybe, dare I say, MORE inspiring) but definitely different. I had heard Jasmine Star speak last year as part of a panel and this year she had a panel all to herself. This time I was really ready to hear her message. Really got it. If last year post-Alt Summit was about a huge number of items on the to-do list, trying a bunch of different things, this year is about focus. Going deep. If last year was about learning to do this or that, this year is about BEING ME. Inspired to just be me. Not getting distracted by what everyone else is doing but focusing on my own goals. Actually KNOWING my own goals. Taking a few risks. Telling my own story. Sticking my neck out. A place where I better my writing, my photography, and my community building. Where I share what I am passionate about, what I care about, what I believe. I wanna attract you or I wanna repel you.